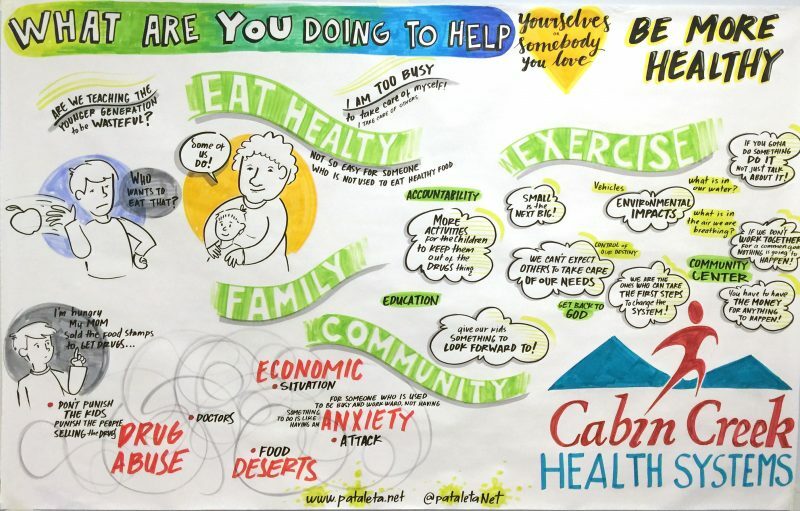 In 2016 Kate Seely, Simone Poutnik, Zulma Patarroyo and Bob Stilger from NewStories worked in partnership with the Robert Wood Johnson Foundation (RWJF) to design, organize and conduct a National Listening Tour on a culture of health across the US. The purpose was to learn how marginalized families and caregivers are creating a culture of health in their communities to inform grant and policy making. The journey took us to Eastern Oklahoma, West Virginia, New Mexico, Arizona and Northern California. Working with local partners and community leaders to convene groups we facilitated 24 community conversations in 16 locations, seven cities and nine rural locations. The insights, patterns and stories have been captured visually and written up in a report to RWJF and shared with all the communities we visited. We were amazed by what we found. People everywhere are stepping forward to make their lives and their communities more healthy.